Land Girls is a British television period drama series, first broadcast on BBC One on 7 September 2009. Land Girls was created by Roland Moore and commissioned by the BBC to commemorate the 70th anniversary of the outbreak of World War II. The programme was BBC Daytime's first commission of a period drama. Land Girls was filmed in and around the city of Birmingham. 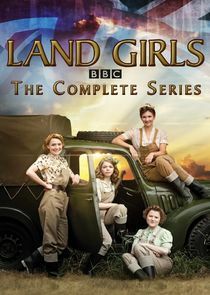 The first series features Summer Strallen, Christine Bottomley, Jo Woodcock and Becci Gemmell as four different girls doing their bit for Britain in theWomen's Land Army during the War. Land Girls won the "Best Daytime Programme" at the 2010 Broadcast Awards and in that same year the BBC announced that it had commissioned a second series, comprising five episodes. Woodcock and Gemmell reprised their roles as Bea and Joyce and Seline Hizlimade her debut as new girl, Connie Carter. The second series began airing from 17 January 2011 and two months later BBC Daytime Controller, Liam Keelan, renewed Land Girls for a third series. It began airing from 7 November 2011.